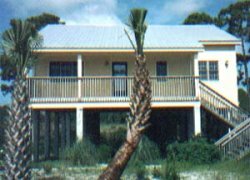 TreeTops is a fully furnished, vacation house located on Bald Point. A white sandy beach on the Gulf of Mexico is about a block away. From the rear deck and screened-in porch you will enjoy a beautiful marshland view. The sunsets over the marsh can be spectacular. * "Your house is beautiful, and in such a wonderful spot. It's so nice to have so many sitting areas for relaxing." * "What a pretty place! Beautiful white sand, rolling surf, and very few people. We read, ate, went in the water, and took in some sun. It was high tide and we found a few shells on our walk. I could stay here forever!" The Bald Point and Alligator Point area is a nature lover's paradise. Boating, fishing, bike riding, and golfing are all available nearby. Bald Point State Park, which is a prime bird watching location, is just a short walk or bike ride away from TreeTops. Bald Eagle, Red-breasted Merganser, Osprey, Marbled Godwit, and Royal Tern are just a few of the birds you might spy. Or just relax on the beach with a good book from our collection!